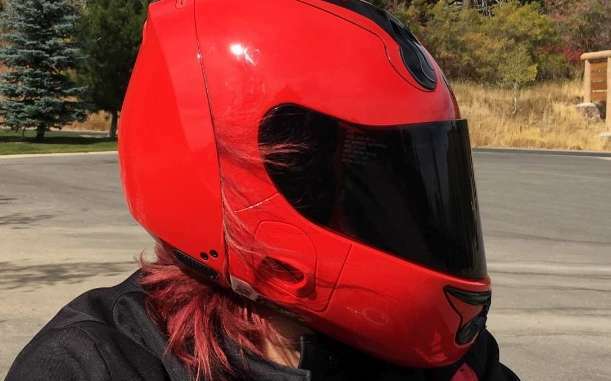 This full face helmet has a certified safety rating from both DOT (North America) and ECE (NZ/Europe/Middle East) so Total Motorcycle reviewed this helmet with focus only on comfort, performance and function. 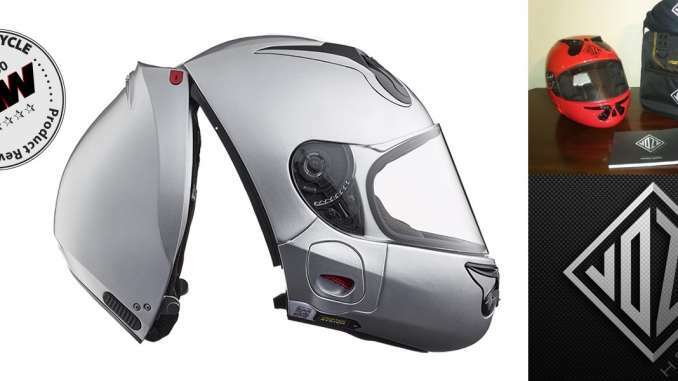 The first thing I noticed about the VOZZ Helmet Voztec System is that the helmet does not have a chin strap. The design consists of two separate pieces permanently attached with a hinge at the top. 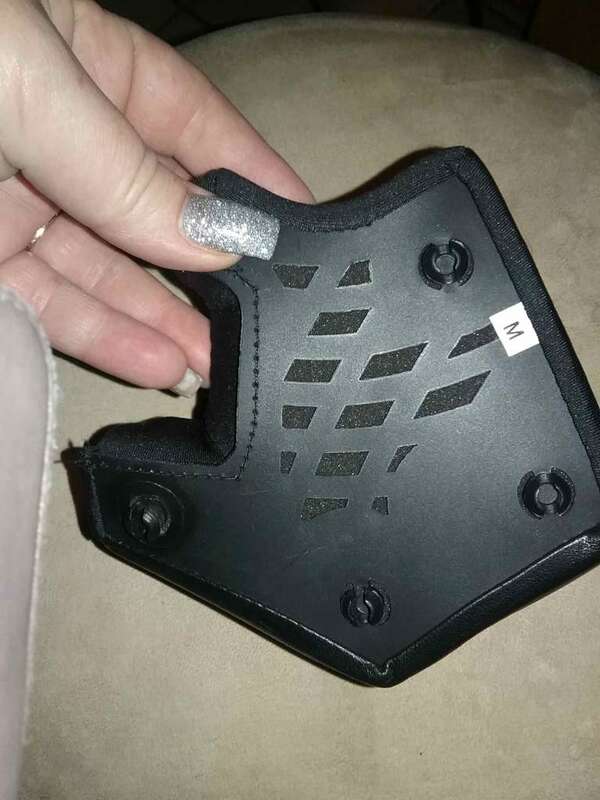 The front and the back pieces snap securely into place around the head. 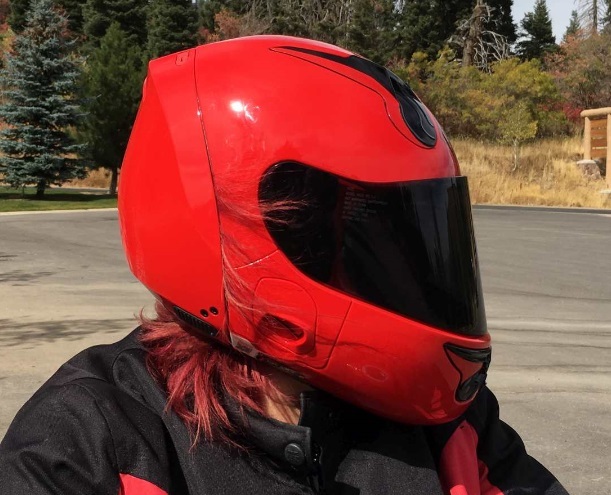 It opens by simply pressing on levers on both sides of the helmet at the same time. Then a flick of the wrists easily opens the hinges for easy removal. Have ever had your spouse wait on you because you forget to strap up and donned your gloves first? Who’s been stuck at rear guard on a group ride for the same reason? Because you were all set, then had to take your gloves off to strap up your helmet. Riding buddies snickering about you inside their helmets, leaving you in their dust while you put your gloves back on. With the VOZZ Helmet design you can easily fasten/unfasten your helmet with gloves on or off and lead the pack. Now all we need is somebody to invent a wallet that you can get into and pay for gas while wearing gloves! The VOZZ Helmet fits closer around the head, because the opening at the bottom doesn’t have to accommodate a head sliding in and out. Instead, an adjustable chin piece fits comfortably around the jaw, line creating a comfortable fit for any rider. It also fits better around the back of the head and molds around the base of the skull. The feel is definitely different than any helmet I’ve ever worn. It took me a little time to get used to the snug fit. 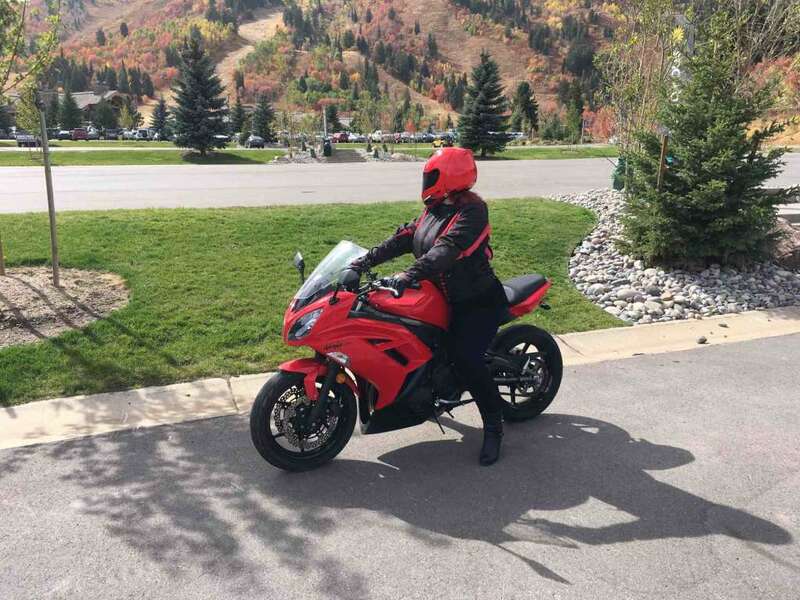 I learned that the comfort level and fit is all about the way you apply the helmet. At first, I tried lining the back piece up against the back of my skull and snapping the front into place. It moved the skin on my forehead down, sort of the way a corset would push my bosom in and up. It wasn’t uncomfortable, but I felt like I lost maybe 1/32 of my field of vision. My most effective placement procedure is to put my face in first. I place my forehead and chin in their respective positions. Then I give a little push on the back piece. 1.2.3. My face is completely comfortable and ready to ride. This helmet style does prove a challenge for a rider with lots of hair. I feel like this design really does a better job of enclosing my head, and so blocks out most excess wind and noise. The visor shuts tight every time. My eyes don’t get watery, even when it’s windy out or when doing excessive speeds on the freeway. My face doesn’t take in any dust or debris at all. The sizing guide is spot on, putting me in a medium when I usually order a large. I feel like this snug fit plays a huge role of making this helmet perform so well. I’ve had trouble on days when I choose to wear my prescription glasses rather than contacts though. Plastic glasses with molded nose pieces have proved to meld better than spectacles with adjustable nose pieces. If you wear prescription glasses I suggest you go a size up. Don’t worry about bringing your sunglasses as the included tinted visor is all you’ll need on sunny days. The shape is aerodynamic, the vents are easy to operate in transit and the VOZZ helmet is light weight. Because of the way the helmet is constructed, there is a lot of extra room in the chin area. You can see from the pictures that this helmet has a very large profile vs. other helmets we’re all used to. Both sides of the chin guards sport QR stickers. 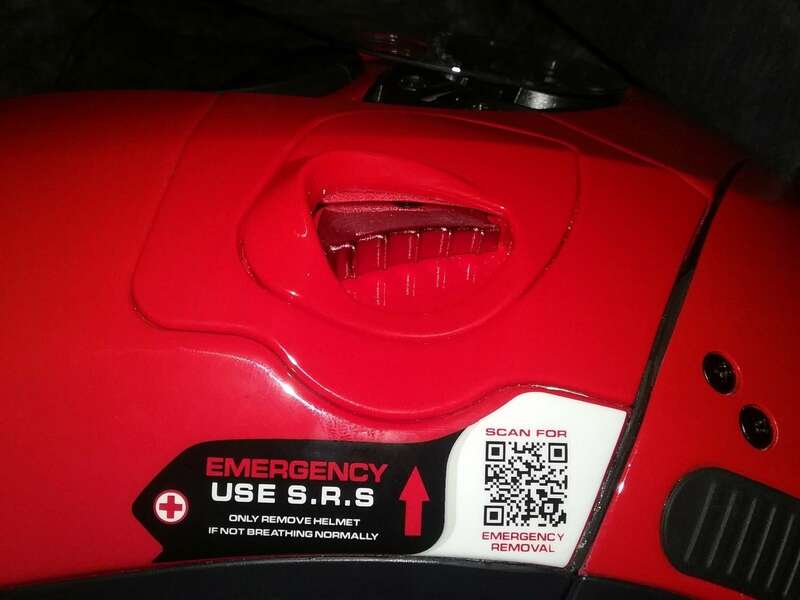 When scanned, the QR codes provide steps for VOZZ Helmet emergency removal in case the responding medical staff is unfamiliar with the design in the event of a severe accident. We attempted to get an ‘on record’ opinion of local medics but that isn’t really something they do without jumping through a lot of legality hoops. We did happen to run into an on duty Emergency Medical Technician shopping for his lunch at the grocery store and asked him for his opinion on the spot. He stated that he has never been trained to look for QR codes and doesn’t carry a smart phone. I’ve heard on the news though that the QR codes are getting more and more popular for medical purposes. The cheek pads inside the VOZZ Helmet are removable. Sturdy plastic pressure snaps hold them in place. They have side vents to accommodate speakers on a Bluetooth Headset Communicator. I had some trouble getting the cheek pads to snap in over top of the speakers and wires on my SCS Bluetooth Communicator. One side of the ear piece has folded stitching (this is different than the other edges of the pads that are stitched directly to the plastic side mold.) I unpicked the folded stitching and created a nice inner pocket. No doubt that was what VOZZ intended with the pad design. My speakers fit perfectly inside the pads. The pressure snaps went securely into place and have stayed put. As you can imagine, my sound quality is absolutely amazing. My husband can hear my voice clearly over the communicator. My music app honors my verbal station request first time every time. Thanks to The VOZZ Helmet Voztec Design, my speakers and microphone aren’t competing with wind and road noise. The first thing you’ll see when you unbox your shiny (or matte) new VOZZ Helmet is a very attractive and well made helmet bag. I’m not talking about a drawstring bag with a logo, but something that would rival name brand carry-on flight luggage. Inside the bag you will find your new helmet plus a tinted visor in it’s own little drawstring bag, how cool is that? The bag has multiple straps with Velcro handles and zipped storage compartments for personal items, such as your contacts case and cleaning solution or a separate visor and cleaning cloths. You won’t need to carry a bottle of anti-fog solution though. I huffed and puffed myself into a frenzy at stop lights on cold mornings, just daring this helmet to fog up on me and it never did. If you’re a rider that isn’t afraid to ride clear roads on winter mornings you’ll know exactly how big of a deal this really is. 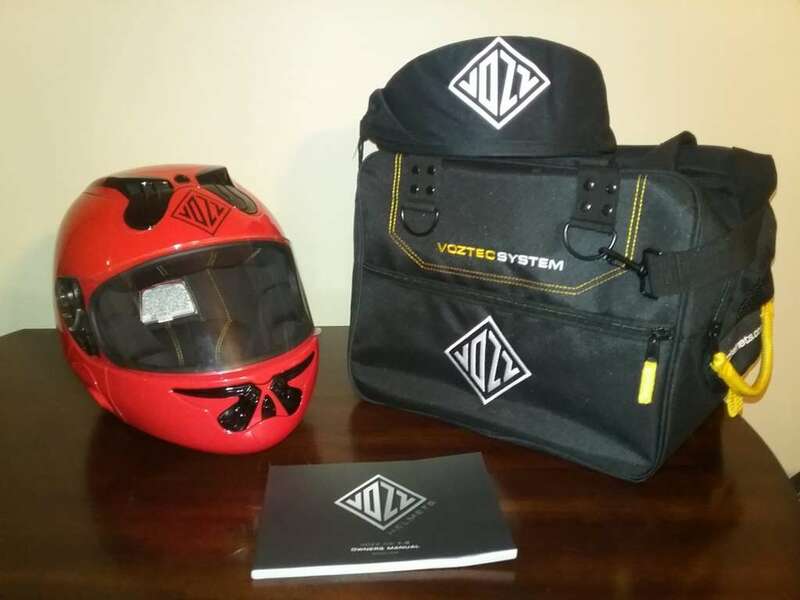 In fact, I have no doubt VOZZ helmets may be rather popular among snowmobile enthusiasts this winter. 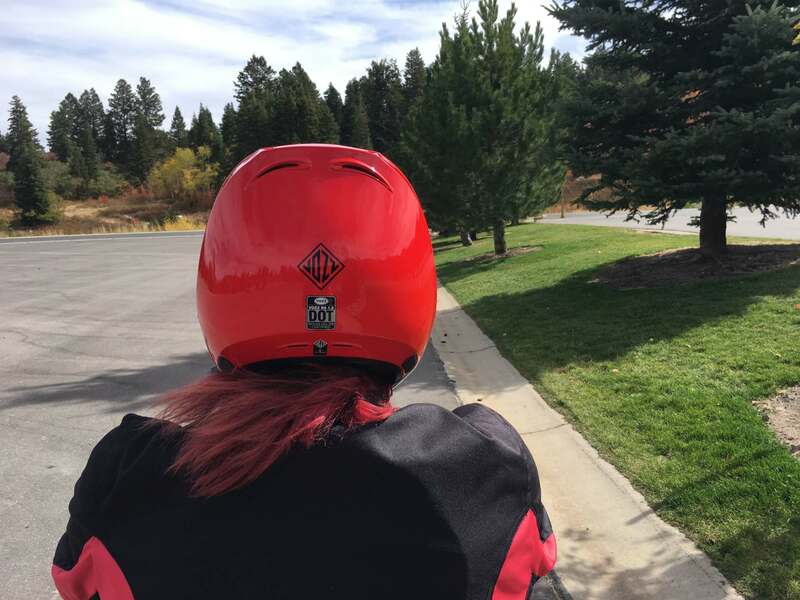 You’re sure to find a VOZZ Helmet to match your bike, as they are offered in a variety of colors, Matte Black, Gloss Black, White, Red, Blue, Orange, Green and Silver. VOZZ sells additional visors in tints of Iridium Blue, Iridium Chrome, Iridium Gold, 80% Tinted and Clear replacements. The visors come in their own drawstring black cleaning bag sporting the VOZZ logo. You’ll find plenty of extra space in the bag mentioned above to house a collection of visors. Visit VOZZ and see them out for yourself! Check out my video link above to see how unbelievably easy it is to change out your visor. At the table at home or in a parking lot on the go, just a simple pull on the tabs and the visor snaps right out or in. I’ll admit I’ve scratched a lot of visors during the replacement process in my past. VOZZ made this so easy for us the process is fool proof. I know lot of riders that will run with a tinted visor during the day and pack a clear visor for the night ride home. Keep in mind, an extra visor sure can take a lot of abuse in a saddlebag over time. As mentioned above, VOZZ includes a separate storage bag to keep your extra visor safe. I LOVE LOVE LOVE this helmet. 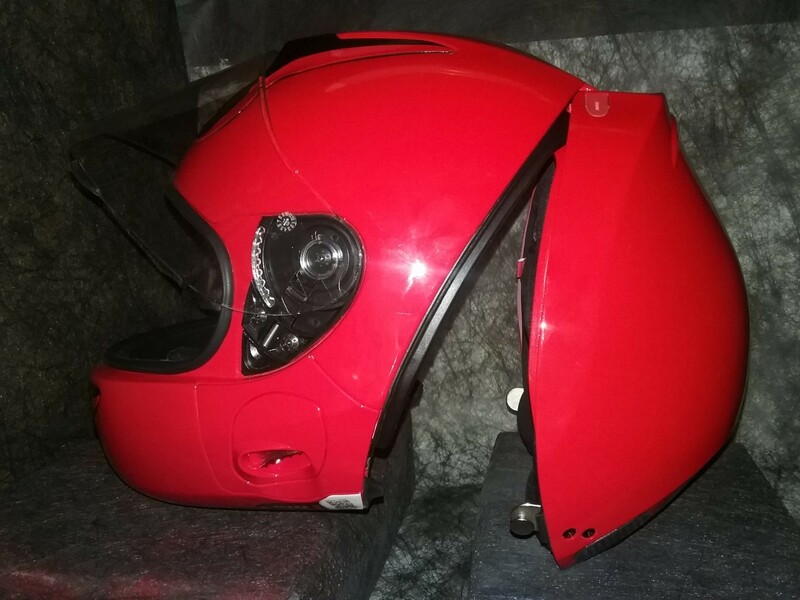 I’m confident it will keep my head safe, my face comfortable (even on long rides) and my mind won’t doubt it will last as long as a good helmet is supposed to. 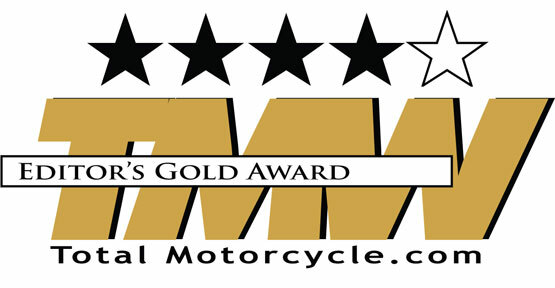 I am pleased to award it with the Total Motorcycle Editor’s Gold Award 4 star rating. The few hitches I mentioned earlier unfortunately kept me from giving the esteemed 5 stars. As with any new technology there’s always gonna be a learning curve. Or, perhaps a few features that are just too far from the norm for people to get up to speed with. I had to perform a bit of surgery on the cheek pads to get my headset securely mounted. I know more riders that require prescription lenses than those that don’t so that’s a big concern. A rider shouldn’t have to sacrifice sizing to accommodate eye wear. The technology is ahead of the times here in America as our local EMT/Firefighter wasn’t trained to look for QR codes. And lastly, I’m still learning how to keep my hair from getting closed in the sides. Make sure to check out Vozz Helmet’s Booth at the AIMexpo Vegas! I really had a lot of fun getting unhinged and going strapless with VOZZ Helmets. Everybody I meet wants to get their hands on my VOZZ and check it out. Who can blame them? Total Motorcycle is proud to award the VOZZ Helmet RS 1.0 with our Editor’s Gold Award! We love it and can’t wait to see what VOZZ does next. Thanks for extending the opportunity to review this Helmet. Whatever helmet you choose to wear, wear one every ride. Wear one every time, whether you’re going on a 4 day road trip or just around the block. Stay safe. Ride like your mom’s watching (She is). Race like your kids are waiting at the checkered flag. Ride like you’re wearing Harry Potter’s invisibility cloak in case nobody sees you. 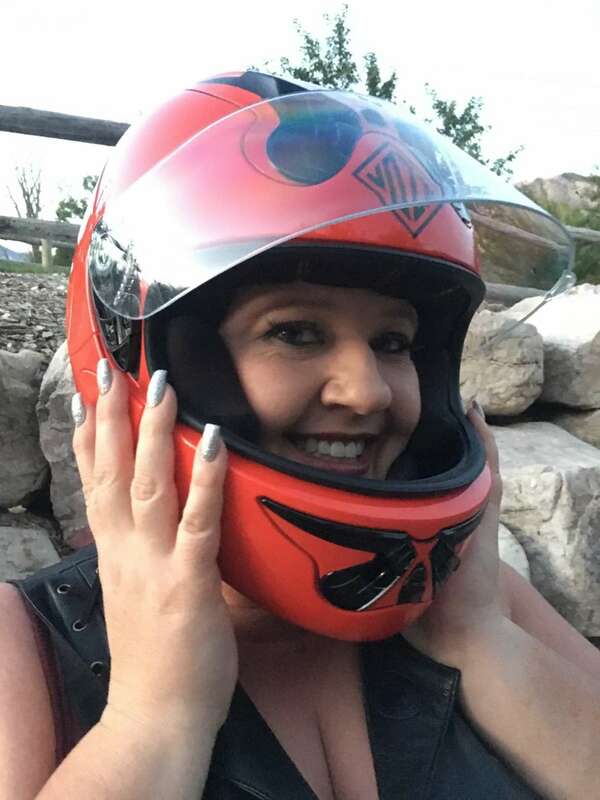 I want to extend a special thanks to our new sport bike friends Mr. & Mrs. Ward of Vernal, Utah for suggesting that TMW check out the VOZZ Helmet.